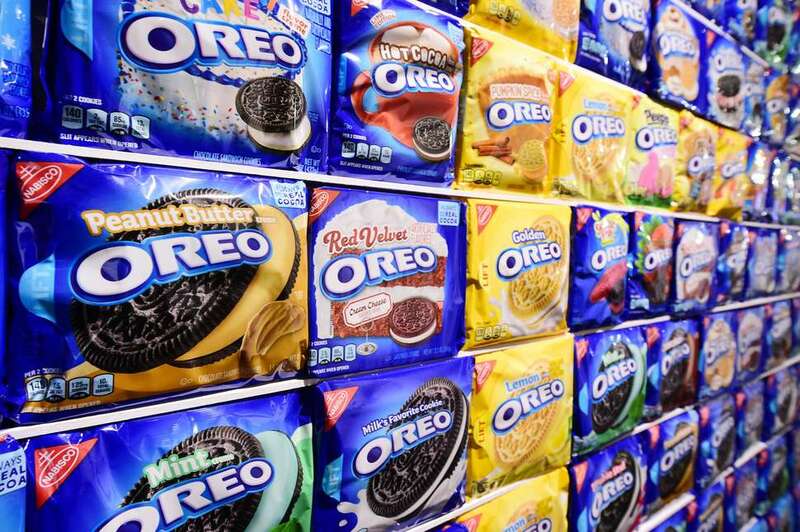 Other than craft beer in a can, The Bachelorette, and the NFL, there is no greater American invention than the Oreo. But every Oreo is not created equal. There are actually a ton of flavors, some of which bear little to no resemblance to the cookie your grandparents loved. And some that do, because they probably ate Hydrox. Which of these Oreo (fun fact: the plural of Oreo is "Oreo") is the best? To find out, I tracked down every available flavor currently in stores, including the harder-to-find ones on Target.com and Walmart.com. No Fudge Cremes though -- we don't consider them a true Oreo, what with all that fudge on top of them. Here they are, ranked from good to best. 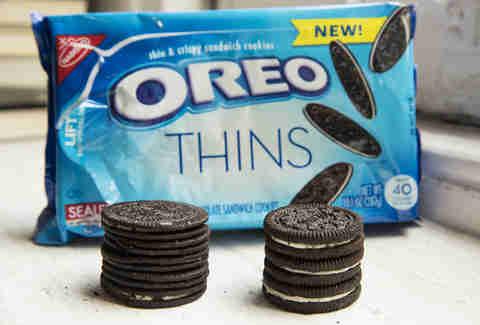 If you’ve never had Oreo Thins before, please know that you barely get any creme in those cookies. And because the flavor of the chocolate creme disappears into the flavor of the chocolate cookie, this tastes like a plain chocolate cookie. Let me rephrase that: If you put aside the very slight change in texture from the chocolate creme, eating this is like eating an Oreo without any creme in it. I’ve unintentionally coined a very sad metaphor for something, but I’m not sure what. If you figure it out, let me know @LeeBreslouer! See: chocolate cookie Mega Stuf (No. 23), with the added fact that the vanilla creme overpowers the subtle vanilla cookie (aka the Golden cookie, which is how we're referring to it in the rest of this ranking). When I go to an ice cream shop, I don't ask them to spray a pound of whipped cream on my ice cream, because I'm an adult. I crave subtler flavors. The amount of creme here is just too much of a good thing. I love chocolate, and that's the only flavor here. Chocolate cookies and chocolate creme. So I was expecting to love it, but that didn't happen. Since the Oreo debuted, chocolate flavors have come a long way. I routinely eat 85% dark chocolate bars from national and local artisanal producers. The variety of chocolate out there has turned me, and much of America, into a chocolate snob. Nowadays, if you're only giving me basic chocolate flavors, they better knock my socks off. Oh wow, this smells exactly like that hot cinnamon candy you probably remember from your childhood! Sadly, the cinnamon burn is certainly there, but it’s pretty mild, even for a wimp like me who doesn’t like things too spicy (though strangely, it lingers like an acquaintance who’s been crashing on your couch for a week). I was hoping this Oreo would provide a serious cinnamon kick, but instead it gave me a cinnamon kiss on the cheek. If the box would have read simply “Caramel,” I would’ve been perfectly happy with what it delivered. But instead it read: “Salted Caramel.” Now we’ve got a problem. It’s certainly full of perfectly fine caramel notes, but in order to get any salt flavors, you’re probably going to have to coat it in a layer of sea salt. Which sounds kind of gross as I type it, but keep in mind I’m also eyeing the salt shaker on my kitchen countertop. This makes me sad about birthdays. And it's strange to be typing that, because you'll see another version of the same exact cookie that Oreo made much higher in this ranking. The chocolate and birthday sprinkle-laden creme just don't mix to create beautiful Oreo harmony here like they should. Instead, it feels like there was an accident at the Oreo factory and sprinkles accidentally were added to one of the more perfect cookies ever created. “30% less fat than original Oreo!” the box exclaims. On the plus side, it tastes like a regular Oreo! But to me, either you eat an Oreo or you don't. I don't think this 30% fat reduction is making anyone less chubby, but whatever helps you sleep at night. Something that has the words “thin” and “mint” in the name and isn't a Thin Mint? That's just mean. This is as much a Thin Mint as a wax figure in Madame Tussaud's is the real thing. I love coconut milk, coconut water, coconut flakes, and Jason Schwartzman’s solo project Coconut Records. I also love Coco Austin, Ice-T’s wife. With so much real coconut in the average American’s diet these days, it’s tough to get excited about this fairly bland, artificially flavored coconut creme. The lemon flavor creme here is a little too Lemon Pledge-like and not enough Savannah Smiles for me. That said, I’m not kicking this Oreo out of bed. As in, I will literally eat the entirety of this package in bed later tonight. I have to admit that I didn’t grow up loving Peeps. I hold no warm place in my heart for that bird-shaped monstrosity some people think is good junk food. Give me Cadbury Eggs all day. So I was a little nervous to taste this. But it’s not horrible! I wouldn’t say it tastes exactly like Peeps, and that’s probably why I like it! If I can put myself in the shoes of someone who loves Peeps for a moment (and I believe I can), the texture is part of the Peeps experience. You don’t get that in this cookie, obviously. Instead, there’s a flavor creme that tastes like Peeps that’ve been out in the sun for too long. Buy this for the brand synergy if you want to, but I’d recommend buying actual Peeps if you want that sweet, sweet Peeps flavor. I'm bored with these. As a kid, I wanted nothing more than for my mom to bring home normal, American-as-apple-pie Oreo cookies. I never got that wish, and ended up eating them at the homes of less-healthy families. As an adult, I've eaten a billion different flavors of these things, and have found the original to be lacking. I'm not saying the two chocolate cookies and vanilla aren't still delicious, but I've changed, Oreo. And I need something more in a cookie. What does spring taste like? I thought I was going to find out, but the cashier checking me out at Target told said the creme flavor doesn’t taste like anything different from a normal Oreo. It was a bummer. 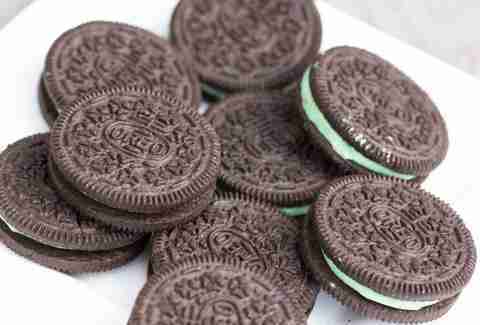 But it sure does look festive, so it gets a slight edge over the regular Oreo. If for some reason I had forgotten what the consistency of a Nilla Wafer cookie felt like, I could be convinced that this was a Nilla Wafer cookie. And that's not a bad thing. Crush these things up and put them in my banana pudding. Refreshing! The mint has a pleasant aftertaste. And the chocolate cookie and the mint play off each other splendidly. The problem is that this hint of mint just makes me want to have some real mint action in the form of a mojito. An even bigger problem is that I'm supposed to be working and not drinking a mojito. Whatever, getting one anyways. This has two Golden cookies sandwiched around lemon creme, which means it only resembles an Oreo in shape, and not at all in taste. It's like a Nilla Wafer someone spilled lemon juice on. This is mad boring -- it's just a regular Oreo that's subbed two chocolate cookies for two vanilla ones (aka the Golden cookies). But I recognize its importance in the Oreo game, because without this cookie, you couldn't get amazing other varieties that utilize the vanilla cookie. This is the Oreo lineup's utility player, like Ben Zobrist of the Chicago Cubs (or so Google tells me). This is the Oreo for those indecisive jerks you know who can never make a decision. Do I eat the Golden Oreo or the plain? Oh, the struggles these people go through every day. Clearly Oreo is catering to these people, and this experiment is... actually a success. I guess I shouldn't be surprised that a vanilla cookie and a chocolate cookie go so well together. “Awww, wook at the witty-bitty Oreo,” I definitely said to myself as I cradled this tiny version of the cookie. Then I bit into it and thought about this thin Oreo a little more. So, they're just giving you less of the cookie you know and love? Why would I pay for that? Because sometimes less is more. You get all of that Oreo flavor, plus the possibility of eating a sleeve of these in one sitting: if I eat a regular Oreo or three, I'm usually set, but I can inhale a few handfuls of these and not even blink. More is more, too. You know how many millions of Oreo cookie boxes Nabisco would sell if this had the Nutella logo plastered on it? I don’t know, but only because science would run out of numbers and they’d have to invent new ones. 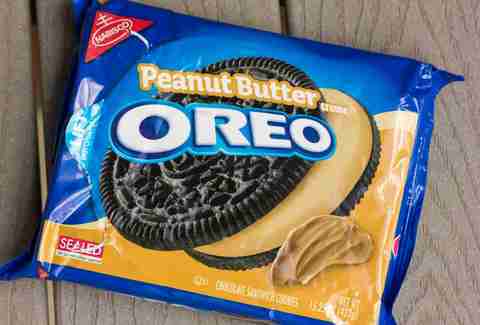 Nabisco would probably make more money than Apple. But despite the generic chocolate hazelnut flavor here, the good news is that this cookie has that familiar Nutella aftertaste of sugar, hazelnuts, cocoa, sugar, and sugar. Loving that Oreo substituted a golden cookie for the chocolate ones we’re used to. Exactly like the Double Stuf Oreo with chocolate cookies, but not as good. Still pretty good! If Mega Stuf is too much creme and normal Oreo is the right amount of creme, Double Stuf is a little more than the right amount of creme. That makes sense, right? The Double Stuf Oreo is a uniquely American product. 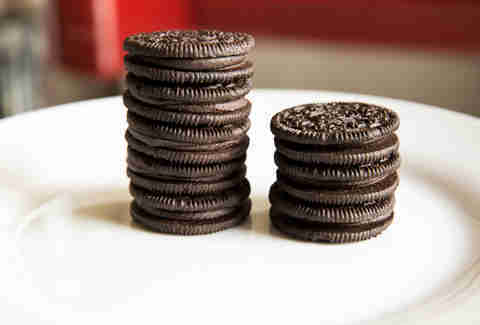 Nabisco went all McDonald's on the Oreo and Super Sized the creme. It's an original product -- I didn't know I needed more creme in my Oreo until this came along. The only knock is that Eli Manning was once paid to endorse this product, and as a lifelong Eagles fan, I cannot in good conscience enjoy this. I mean, it's good and everything, but I don't like it. This Oreo is the new girlfriend of your friend who clearly only started dating her because she looks just like his ex -- I say that because this is a straight-up Reese's Oreo clone. Because the Reese's Oreo was a limited-time cookie, this is here in its place. Don't worry, you can still find Reese's Oreo on eBay and whatnot. Anyways, it falls a little short, because a copy will never be as good as the original. If Michael Keaton were an Oreo and his movie Multiplicity was about a guy who clones cookies again and again, this would be the second or third Michael Keaton -- not super dumb, but also not the original. That said, you'll always win points with me for combining chocolate and peanut butter. Pretty sure they melted down a birthday cake into a cookie, because I don't know how else they nailed the taste so hard. If I didn't know what I'd just eaten, the aftertaste would make me think I was just at a kid's birthday party. It's uncanny. I’ve never seen the words “Artificially Flavored” in such a large font on an Oreo package. It’s like Nabisco is telling you, “Yeah, we didn’t actually grind an entire red velvet cake down and then reshape it to look like an Oreo.” Though after eating this... are we sure they didn’t? This could’ve fooled me. I love the cream cheese-flavored creme, and combined with the deep red-colored cookie, it makes me feel like I’m eating a red velvet cake that’s been grinded down and reshaped into an Oreo. You know, like I said earlier. If I'd had these as a kid, I would have been obese. Now that I have them as an adult, I still might become obese unless I throw them away. As a kid, though, I'd have eaten them for breakfast floating in a bowl of milk, for lunch also floating in a bowl of milk, and for dinner I would've just shoveled handfuls into my face. They figured out how to pack all that Oreo flavor into a smaller package. Genius! “Oh hell yes.” Those were the extent of my notes after tasting this. This tastes like eating icing. The cinnamon cookie -- which I don’t believe they use in any other Oreo -- combined with the amazing icing flavor creme turns this cookie into a magical, cinnamon-spiced ride for your taste buds. No longer do you need to schlep to a mall food court or an airport when you need a fix. 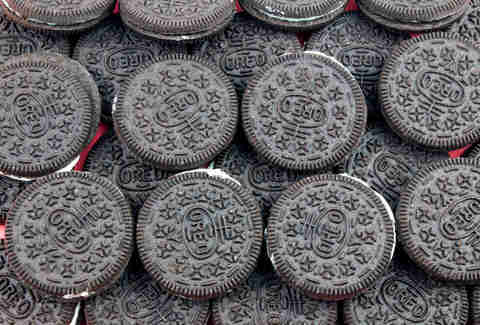 Even better, I’m willing to go out on a limb and say this is the best tasting Oreo that Nabisco has ever manufactured. We’ve come a long way from two chocolate cookies and a vanilla creme filling, haven’t we? 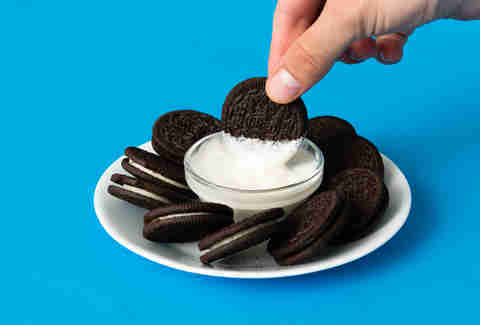 Lee Breslouer is a senior writer at Thrillist and is not sick of Oreo yet. Follow him to peanut butter/chocolate combinations: @LeeBreslouer.